John E. McIntyre has long been a source of wisdom for journalists, particularly colleagues at the Baltimore Sun and fellow copy editors. 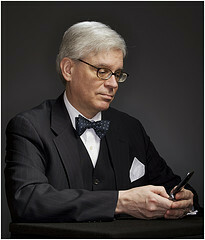 He is a founding member (and two-time former president) of the American Copy Editors Society. 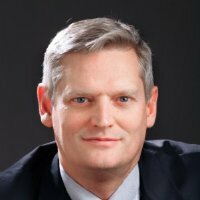 I knew of him long before I met him, when he led a discussion for a seminar I was planning for news editors and copy desk chiefs at an American Press Institute workshop, probably in 2006 or so. He’s a guardian of the language who enforces the rules that matter and debunks the ones that don’t. He may be an Old Editor, but he’s also a prolific blogger and podcaster, a witty tweep and he was the first person to point out that I was violating Facebook etiquette early in my social media days by syncing my Twitter and Facebook accounts so that nearly all my tweets posted to Facebook (way too often to post on FB, but an acceptable pace for Twitter). 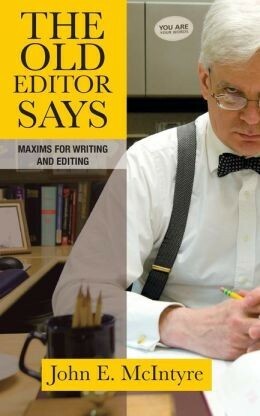 I’m pleased to see that John has compiled some of his wisdom into a book: The Old Editor Says: Maxims for Writing and Editing. I didn’t pass, or expect to pass, April’s record of 31,197 page views, driven mostly by my Dear Newsroom Curmudgeon post. Still, at 27,361 views, May was the second most-viewed month in the three-plus years I’ve been doing this blog. I am honored that the Baltimore Sun’s John E. McIntyre, whose blog is a must-read for copy editors, has responded (at my invitation) to my advice for copy editors. John and I also agree on the importance of copy editors training themselves in new skills. I won’t quote from John’s private advice to copy editors (he asked the rest of us to step outside for a moment, but I listened through the transom), except to say it was right on the mark. That last point is good advice for every journalist. And it always was. When writing Digital First, how do you handle ‘today’? Update: If you read this when it was posted initially, or after I updated Tuesday night with lots of responses, I have added more responses, plus my own recommendation. When I was visiting the St. Paul Pioneer Press newsroom recently, some copy editors asked a perplexing style question: If we are creating content first for digital platforms, and trying to make a print product efficiently from that content, how do we handle references to “today”? “Tomorrow” can be problematic, too. Newspaper journalists have traditionally avoided “yesterday” and “tomorrow,” making them “Monday” and “Wednesday” if you’re publishing on Tuesday. So it’s probably still a good idea to avoid “yesterday.” But “Wednesday” should really become “today” when that digital story is published in the next morning’s newspaper.